Eclipse the competition with this great single ball roller from Ebonite. 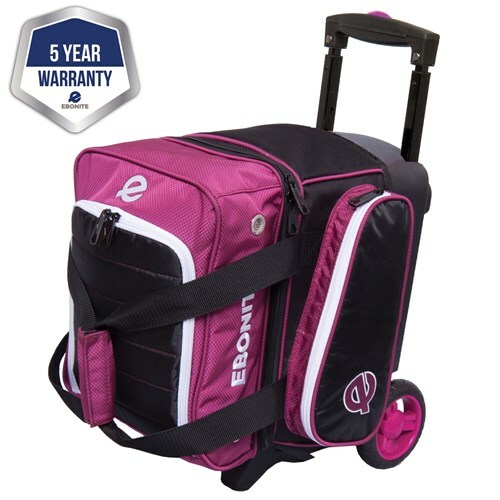 The Ebonite Eclipse Single Roller bowling bag is made of durable 600D fabric, it can hold one bowling ball along with shoes up to a men's size 13, and plenty of accessories. This fun bag has added style with color coordinated handles and wheels! Dimensions: W 10" X D 16" X H 20"
I did a great deal of research before buying this bag, and I'm very happy with it. My prior bag had small, very noisy wheels, which also meant the bag itself scraped against curbs and got ragged edges. This bag has plenty of room for shoes and accessories, but few things fit in the "roomy side pocket," because it is small and shaped oddly. Nevertheless, there is plenty of room in the shoe and ball compartments for anything that doesn't fit in the side pocket. I'm very happy with this bag and highly recommend it. This price is in US dollars. Due to the time it takes to produce the Ebonite Eclipse Single Roller Plum ball it will ship in immediately. We cannot ship this ball outside the United States.